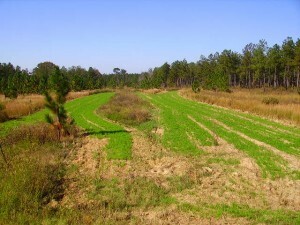 Most deer food plots consist of fall plantings of wheat, oats, clover or a mixture of all. These plantings are used to draw deer out in the open during the hunting season. Often, people harrow them under in the summer and plant iron clay peas or some sort of summer forage that is readily mowed down by the browsing deer. The next fall this same area is harrowed up again and the cycle continues. As a result, quail receive little or no benefit from your investment of money and effort. Now before we talk about a few ways deer food plots can be incorporated into you quail management, we must understand three basic principles. 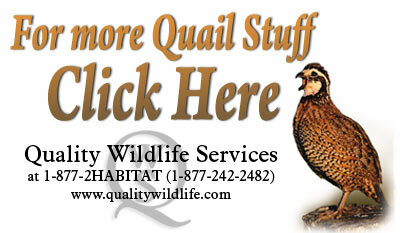 First, it is important to realize that bobwhite quail prefer a one to three year “rough”. What I mean by this is that if we were to burn or harrow up a field and leave it, we would see the most productive plant community for quail present during the following three years. The second principle to understand is that it is important to have a mixture of all three stages of plant growth (year one, two and three) with in the covey’s home range. As an example, let’s say we have three small adjoining fields each about ten acres in size. During the fall season of the year we would want to harrow up one of the fields the first year, harrow the second field the second year, and harrow up the third field the third year. During year four we would start the process over with the first field. If we were talking about one big field then we would simply use this same strategy by disking one third of the field each year. The third concept of habitat composition is to also include slivers and clumps of four-year growth. This provides escape cover in winter or shaded loafing areas for the broods in the summer. 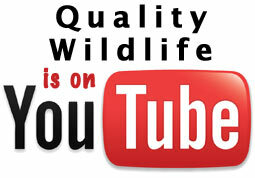 It has been said that good quail habitat is a matter of “organized chaos”. In a nutshell, the best habitat is a mosaic or mixture of everything we’ve mentioned. Now let’s take what we have just discussed and see how deer food plots can be used to help us manage a quail project. On the sandy lands of the Southeast Coastal Plain, I often use a mixture of oats and hairy vetch for my deer food plots located on quail areas. Using this as an example, let’s track the progress of a hypothetical deer food plot. It’s January (year one) and we have a ten-acre deer food plot of oats and hairy vetch. At this time we see that deer are hard up for food and the plot has really taken a beating. As the days get longer and spring approaches, we see the deer beginning to discover other food sources and their dependence on food plots has diminished. It is at this time we would begin to see our oats gaining height. The vetch will also begin to flourish and climb up the oat stalks. If we just leave this plot alone we will see that during March and April this area will provide green forage and insects. This is a valuable source of nutrition for breeding pairs of quail preparing for the nesting season. By the end of May, the hairy vetch (a legume) will have made its seed and begin dying. This process has just put up to 200 ponds of organic nitrogen per acre on the plot. The oats will continue growing and producing kernels of grain. During June and July, the oats are beginning to produce an abundant crop of insects and annual weeds are beginning to invade the stand. The deer plot is now providing our quail broods with a high protein diet as well as concealment from predators. August arrives and it is time to prepare deer food plots for the coming season. Let’s implement the principles we discussed earlier. Instead of harrowing up the same plot, we are going to move over and harrow a new ten acres, leaving a 100 to 150 foot wide buffer between the new plot and the previous plot. The previous plot will be allowed to “go fallow” or undisturbed. As the next year passes, the cycle of events discussed will be repeated on the new plot. While the old plot, going through a second year of plant growth, will provide shade from summer heat and nesting cover.The third year we will rotate our deer food plot to the third location while leaving our first and second fields alone. Remember we are leaving wide borders between the fields to eventually provide heavier cover and hunting edge. The fourth year we can now go back to our first field and prepare it for a deer food plot again. In summary, we have seen what quail prefer as habitat and how this habitat can be produced as a by-product of systematically rotating the location of deer food plots. This concept is should also be considered if you plant quail feed strips or dove fields on your property. Instead of planting in the same place each year, spread your activity around. In doing so you will reaping a lot more “Bang for the Buck”!